The topic of last week’s free sales newsletter was Improving your sales skills and it received a great response from many readers. The sales tips were on how to make sales training work outside of the classroom in real sales situations. We received stacks of comments from Newsletter subscribers and you can see a selection of them on the site Blog at Sales Training Blog. Many people asked if I could put the ideas into an easy to follow process that they could follow to make their sales training effective in the real world. 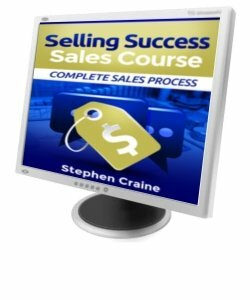 So there is now a page on the Sales Training Sales Tips website with a step by step guide on putting training courses into action to increase sales. You can open the page in a new window at Professional sales training tips. We continue the theme of increasing sales by looking at selling techniques that professionals use in all types of sales roles. This sales training is for all types of sales people. From direct sales to corporate sellers that give full blown presentations. Whether you sell to retail customers or B2B. If you sell low cost items or big ticket goods, you need to grab the buyer’s attention so they listen to your pitch or sales presentation. In this week’s issue of the Sales Buzz we look at examples used by working sales professionals that you can take away, develop, adapt, and play around with to increase your sales. See the latest updates on the Sales Training Sales Tips website. If you don’t grab the sales prospect’s attention right at the start of your sales pitch or presentation you will not close the sale. There are 3 main reasons that you must grab the attention of your sales prospects. In retail sales, showroom or car lot type situations you need to make that initial contact with the sales prospect that has entered your sales space. In direct sales, telesales, or any type of cold calling, that first line must hook the listener to give you a chance of continuing the pitch. When making a formal presentation, in b2B sales, or to a group of potential buyers, you want to give them a reason to see you as different to the other sales people they may be seeing. A good attention grabber breaks the ice, opens the conversation, and makes that important connection between you and the sales prospect. In your sales introduction you tell them how they could benefit from giving you their attention. Even in retail and sales floor situations you want to say something that will make them think they have something to gain from listening to you. Direct sales and telesales professionals know that the attention grabbing line stops doors being closed and telephones being put down. When selling to businesses a clear attention grabber will buy you some time as the buyer is hooked with potential benefits. In formal presentations your reason for being there may take the form of an overview of what you want to achieve, from the buyer’s perspective, with your presentation. A good sales pitch has several sales stages. The first stage is the sales introduction. The objective of the sales introduction is to get you through to the next sales stage, usually questioning. If you don’t grab the buyer’s attention with your introduction you will not get a positive response to your questions. When giving a formal sales presentation a good attention grabber will wake up your audience so they take in the information. In telesales and direct selling an attention grabber is crucial keep the buyer focused on you and what you are saying and not any distractions around them. Let’s start with an example I have seen used in B2B sales. The salesman visited sales prospects and repeat customers from different cultures and ethnic origins. He took the time to learn a few phrases in the native languages of the people he sold to. This made him stand out from other sales representatives. It broke the ice with his prospects, usually as they corrected his pronunciation. Prospects respected him for it. And often a really good relationship would be built as they tried to teach him a new phrase. This technique takes time and effort, but in the right sales role your investment will be rewarded. You will stand out from your competitors, build good relationships with regular customers, and grab the attention of new sales prospects. Used by street traders, charities, mailshot marketers, retailers, direct sales and many more. Free gifts can range from a pen to a free survey or audit of your business. Competition entries can also come into this category. Come to our sales presentation and go into the draw for a free holiday, car, or whatever. Time share sales people give free gifts to children so their parents feel obligated to give their attention in return. Direct sales and B2B sales people may offer a free survey or audit as a way of drawing your attention to needs that you may have. 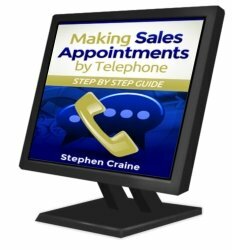 For more on how to use this effective selling technique to make sales appointments open telephone sales skils. Could a free gift be a selling technique you could use to grab your prospect’s attention, make them feel obligated to listen to your sales pitch, or help your customers to see their needs for your products. A sales opening technique that is used in informal sales situations where you want to make your prospects stop and think. Then you use that split second interruption of their thought patterns to form a link between them and you. Sometimes done in the form of a question. A car sales man asking, how important are your children. Then following up by offering to show the prospects the safest cars available. This is a good sales skill for retail sales people to learn. It is far more effective than the usual, can I help you, that many still use. I have heard of examples used by some direct sales and telesales people that are not entirely ethical. For example: House alarm salesmen saying, I just want to give you some information about recent robberies, personal attacks, etc. Insurance sales people telling customers their drains were subsiding. Then explaining they’re not but what would you do if they were, before moving into a sales pitch on house insurance. In a more formal sales meeting you might want to think of an unusual way to start your sales pitch or presentation that will make you stand out from your competitors. This could even be a new slogan for your business. There is a lager beer on sale in the UK that uses the slogan, reassuringly expensive. That will grab your buyer’s attention, and if said with a bit of humour it may well break the ice with some laughter. A good example of an attention grabbing phrase is to tell your prospect why you know you can help them. Something along the lines of, I have done this for all these other people so I know I can do it for you. Sometimes called social proof, this works because the buyer wants to know what your proof is. They want to know who you have done this for, what exactly you did for them, and what they may be missing out on. You can use it at all levels of selling. I’m here because I have helped other people to overcome a problem that I think you may have. Or, I’m here to help you gain something that and I can prove I can do it because I have helped others to do exactly the same. This is a conditional offer. You are telling the prospect that if they give you some of their time they may gain something. The more specific you can be about the time needed and what they may gain the more effective this attention grabber is. I like this sales technique. It tells your prospect what you initially want from them and what the return could be on that investment of their time. If you can give me 20 minutes of your time I will show you a way to save 10% on your business running cost. This focuses the prospects mind on what you are going to show them. Usually because they are looking for flaws in your proposal. But that doesn’t matter, you have their attention and now you can start pitching. This technique works at all levels. Even at top level sales negotiations it can be a way in the door. The above are just examples to get you thinking. Have you currently got a line in your sales or appointment making introduction that grabs the listener’s attention? When you are thinking about how to use this technique in your role consider two things that are important to the prospect. Without grabbing their attention you will struggle to close sales. People listen to what you say when they have a reason to do so. A reason is usually a benefit for them, or preventing a negative. Give your sales prospects a reason to listen by grabbing their attention. More sales training on attention grabbing and building a sales introduction stage for selling and appointment making. See more sales training on building an introduction that will give the buyer a reason to listen to you. Open Sales techniques to build a stunning introduction. If you make sales appointments then it is even more important to grab the prospect’s attention. Cold calling demands that you build an instant connection with your prospect. See how to do this at Cold call scripts for a sales appointment introduction. Give us some feedback on the ideas to improve sales skills. Share your opinions about the techniques above. Your thoughts are invited and your viewpoints wanted. Have you got sales training tips that you can share with the visitors to the Sales Training Sales Tips website? Click the link and simply type in the box, it’s that easy. Having a motivator to influence a customer to buy from you now can be the key to increasing your sales. It can be that extra push that a buyer needs to get them to agree to the sale today. Having a reason to buy now stops them giving objections such as: I’ll think about it, leave me some information, or call me back. There’s a full page of sales training on influencing customers to buy now and how you can add these sales techniques to your sales presentation at Influencing customers to buy now. 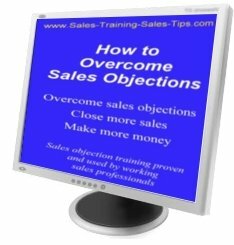 As sales professionals it’s one of the most common sales objections that we face. But do you know why these sales objections happen? Once you understand the reasons behind them you can follow this sales training on handling price objections. You’ll close more sales, make more money, and grow your business. See a full page on Overcoming objections to price.